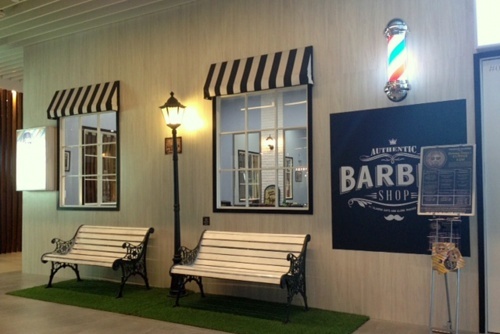 Barbershop chain Premium Barbers has three locations in Singapore, one of which is at orchardgateway (277 Orchard Road). Premium Barbers operates as a full service American style barbershop that does all the old school and modern haircuts, cut throat shaves, beard and moustache trims, and many more. The available range of services varies between the locations. 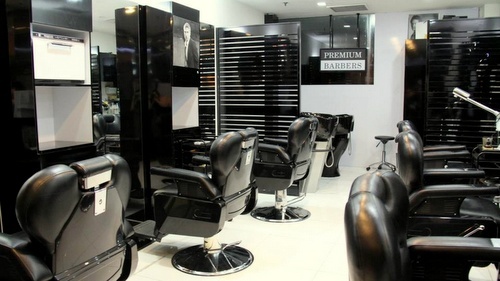 For Premium Barbers International Building, the available main services include Moustache Beard Trim, Grey Hair Colouring, Premium Ear Cleaning, Premium Mudpack Facial, 60 Mins Head Massage, 30 Mins Head Massage, Shave, Premium Cut, Kid’s Cut (12 years old & below), as well as Premium Hair Wash Women. International Building branch also has Combo (more than 1 service for 1 person) service pricing for Cut + Shave, Cut + Beard Trim, Cut + Colour, Cut + 60 Mins Head Massage, Cut + 30 Mins Head Massage, Cut + Colour + Shave, Cut + Colour + Beard Trim, Cut + Facial, Cut + Facial + Shave, Cut + Ear Cleaning, 60 Mins Head Massage + Ear Cleaning, and 30 Mins Head Massage + Ear Cleaning. For Premium Barbers “Orchard Gateway” branch, the service menu includes Premium Cut, Full Head Shave, Hair Colour, Hair Wash, Beard Colour, Beard Trim, Premium Cut + Colour, Premium Shave (Full Shave), Premium Shave + Beard Trim, Premium Cut + Full Shave, Premium Cut + Beard Trim, Premium Cut + Shave + Beard Trim, and Kid’s Cut (12 years old & below). Premium Barbers “VIP” Menu features services such as Premium Cut, Full Head Shave, Hair Wash, Full Shave, Beard Trim, Full Head Colour, Full Shave + Beard Trim, Cut + Shave, Cut + Shave + Beard Trim, Cut + Colour, and Kid’s Cut (12 years old & below). Inclusive in the VIP services are services on VIP Room and unlimited drinks (juice/liquor) & snacks. The orchardgateway barbershop is a ‘Barber Spa’ concept branch, where old school barbering meets modern spa treatments and a hip cool bar. At the spa, their treatments cater to your every need, whether it is to get you cleanly shaved for next week’s meeting, a haircut to look fresh for a hot date, or a hangover treatment that will rejuvenate your senses. Among the popular choices among customers is to have a manicure and a pedicure whilst a facial or any barbering services followed by a massage, but you can also just chill with your friends and have an ice cold beer. The official Facebook brand page for Premium Barbers is available at www.facebook.com/Premium-Barbers-458755094156361. Following the Facebook page, you’ll stay up to date on the barbershops’ promotions, events, new services, and other news related to the outlets in Singapore.